*and are not bothered by it. 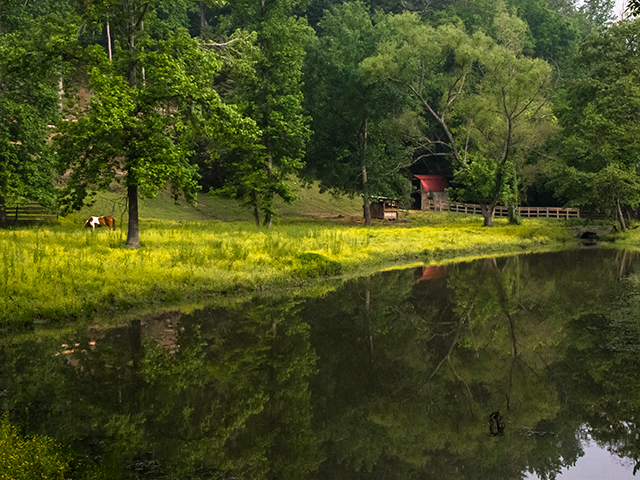 This horse and pond and farm existed right down the street from LMFP (where I learned how to hang glide). One of the instructors there mentioned the ‘horse who was probably really lonely’. I had taken my bicycle to the Flight Park with me so that I could ride while I was staying there getting certified. I was surprised that I had to admit that I had no idea what he was talking about. So of course, that evening, I rode my bicycle there. Let me just start out with saying that those foothills around Lookout Mountain are NO LAUGHING MATTER when it comes to this Midwestern, level ground loving, speed racer on a bicycle. It was less than 3 miles but I thought I might pass out on the way. Then of course, I had to come back. Along the way though I was rewarded with some amazingly beautiful areas. I certainly had lots of time to take them in as my average speed was less than 8 miles per hour (far from my normal of 16 here in Chicago). I encountered lots of foliage overhanging softly sloping and curving roads with rustic looking homes interspersed throughout the whole trip. Of course not all of the journey was fantastic. I almost got eaten by a dog who chased me. That’s never happened to me before, I guess I’ve always been lucky even on my journeys outside of Chicago up in Wisconsin or out in Arizona. I’ve read about it from other riders writing (that was an odd phrase), but was completely unprepared for this wolf to come chasing me out of the yard I wished it had been fenced up in. I think my average went up to at least 12 for that half mile. Adrenaline and fear of being eaten alive work together to do amazing things in the body. It was a relief to reach this farm and field on the way back, it gave me the perfect opportunity to stop and catch my breath. Of course, nobody could possibly tell that I was out of energy or out of breath because I was just able to play it off as a photo taking opportunity. But yes, I did come to notice that this horse was always out in this field, munching the grass alone. It didn’t seem to be uncared for in any other way, but I suspected that there must be some loneliness in that horse brain. The scene brought on a melancholy hat despite the brightness of the colors and the beauty of the field, trees and barn reflected in the pond, I couldn’t ever seem to shake.